As Facebook continues to tinker with its layout and services to spur more interactions and engagement, it seems that not even the most well-known or oldest features are spared. In the most recent development, it looks like Facebook has quietly removed the Ticker, the box that used to appear to the right of your News Feed to summarize what all your friends have been liking, commenting on, and generally doing on the social network. The removal has come after several weeks of people reporting the feature suddenly disappearing for them. Sometime in the last week, on a thread in Facebook’s Help Community started by one of those users, a verified member of the Facebook help team simply announced that “This feature is no longer available.” The question has also now been closed to further comments. It’s not clear why Facebook decided to axe the Ticker. We have contacted the company to see if it can explain more. Generally, Facebook is no stranger to killing off features that are either not being used, or are not progressing in the way it had anticipated, or to bring more focus on other features. I’m guessing that the removal might be down to a combination of all three of those: little in the way of click-throughs to posts from the Ticker (did you notice it missing? ); some general unease over the voyeuristic aspect of quietly watching what others are doing on the site; and on top of that, a push from Facebook to throw a little more promotional power to other engagement efforts. Currently, my right column features a carousel of friends who are posting Stories (Facebook’s newish Snapchat-esque ephemeral photo and video montages). Under that are some prompts to update Pages that I am involved with; upcoming events; trending topics; and ads. 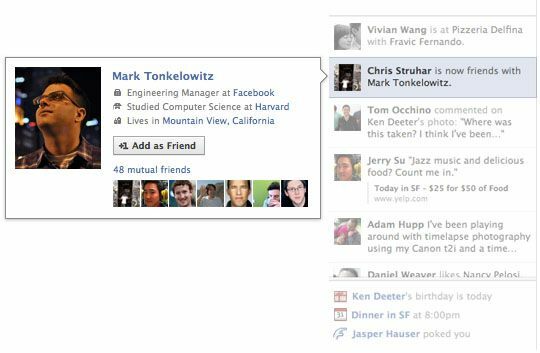 If it’s gone for good, the Ticker is one of the more legacy features to get the chop at Facebook. The Ticker was first launched in 2011, to coincide with Facebook introducing an algorithmic News Feed. Instead of showing you your friends’ most recent posts and interactions in the News Feed, Facebook surfaced posts that it deemed more relevant or interesting to you, as well as posts that were already getting a lot of traction. So the aim of the Ticker was to complement this by giving you a time-based summary of all activity to help you keep tabs on everything if you wanted to anyway, and use those alerts as jumping-in points to start interacting yourself. Facebook has long been chipping away at Google’s and primary media outlets’ position as a purveyor of information, turning into the world’s biggest platform for aggregating and distributing news. But with a lot of controversy over how much fake news is shared on the site, and how that could have influenced major political events like the EU referendum in the UK and the last US general election, Facebook is using its new mission statement to spearhead a more proactive stance about how and what news and other information gets shared on its platform. And that, at last, may be the other reason why the Ticker is no more: it was, in a way, a throwback to Old Facebook. But it’s not just about Facebook’s new positioning; offering a way to keep tabs on your friends may not really be how people use or view Facebook’s role today.